Building a modern, useful product for litigators isn’t easy. We’ve got plenty of tools for the job, but our favorite is customer feedback. Everything we build emerges from conversations we have with litigators who want to manage their facts more effectively. Today, I’m thrilled to announce that we’re bringing one of your most requested features to FactBox. Say hello to Keyword Filtering! What can I do with Keyword Filtering? FactBox has always let you review the details when you knew something of the larger picture. That's the power of filtering facts by Issue, Tag, Key Date, Source or other information we know about your facts. Now that we can filter your facts based on what's inside them, it’s just as easy to go from a small detail to find the context surrounding it. Need to remember when the opposing council called your client a “no-good humgruffin”? Add a keyword filter with “humgruffin” to pull up all the facts in your case that include the term. If you want to generate a custom report around multiple keywords, you can add your second term (or a third) and we’ll surface facts with the keywords for each set of terms. You can also use keyword filters to leave out facts that you don’t want by using the “Exclude” filter. It’s great if you want to surface facts where Joe Doe was in any park except Central Park. How does I use it? 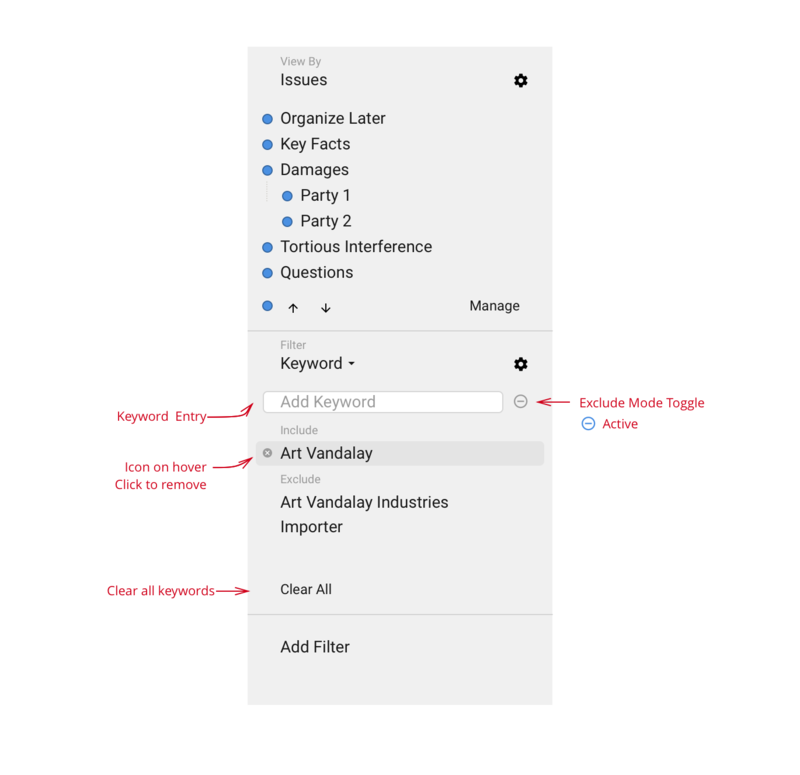 Adding a keyword filter is simple. They can be used alongside other filters, so select your primary "View by" (such as "Key Date") then click “Add Filter” and select “Keyword”. From there type the terms you want us to find. We’ll look for everything you type in a single box to occur in the title or content field of a fact. We’ll restrict your results to facts that match it. We know how important security and confidentiality are to litigators, so we’ve implemented keyword filtering without compromising the encryption of your data. Everything you store in FactBox is as secure as ever – encrypted in transit and at rest. We're excited to introduce Keyword Filters. Not just because you've asked for it – this an extra chance for us to listen to your feedback. Sign in to give it a try and send thoughts or comments on how Keyword Filters could improve to John or Derrick. p.s. One of the next most-requested features is the ability to apply a keyword filter to the documents you’ve stored in FactBox. Rest assured, we’re working on it.